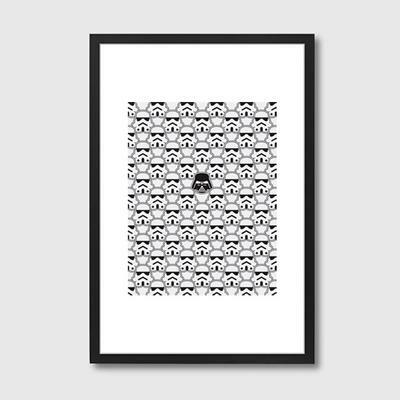 Show your love for the dark side with this cool The Dark One Framed Print. High quality and perfect for every Star Wars junkie out there, the print features Darth Vader and his horde of his stormtroopers surrounding him. You really can't miss Vader, he's right in the centre and the only dark one on the print. Created by artist Davies Babies, it's a fun and whimsical piece to hang in your living room, bedroom or even inside your office. The print is framed in a gorgeous black wooden frame and covered in durable and shatter-resistant perspex cover. You can find these in two sizes so pick one that suits you best.